Sealed bids for the construction of Water Treatment Plant Lab Renovation, Contract No. 1 – General, will be received by the Director, Onondaga County Division of Purchase, 13th Floor Civic Center, 421 Montgomery Street, Syracuse, New York 13202, until 2:00 P.M. Local Time on Thursday, March 19, 2015 and there at said office, at said time, publicly opened and read aloud. The project site is the Metropolitan Water Board's Water Treatment Plant located at 1633 Rathburn Rd, Oswego, NY 13126. This project includes hazardous material abatement and a laboratory renovation consisting of HVAC, Plumbing and Electrical work and related construction. 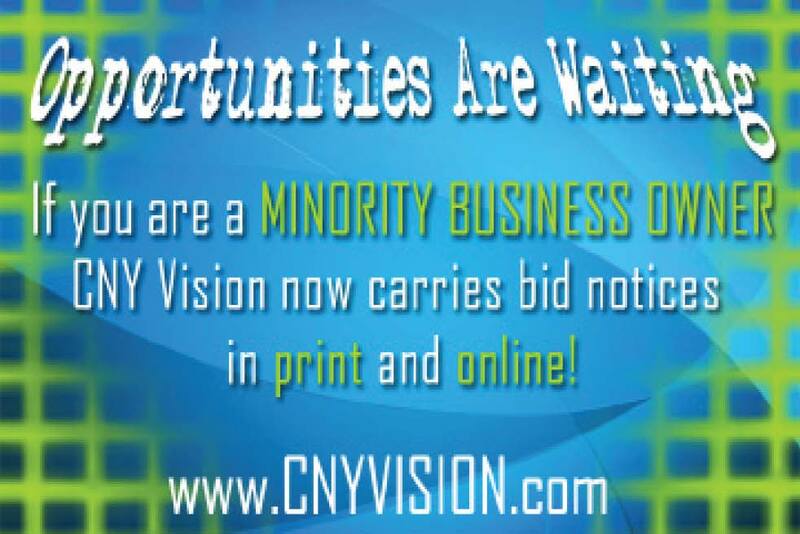 The Pre-Bid meeting will held at 10:00 A.M. Local Time on Tuesday, March 3, 2015 at the Metropolitan Water Board Alexander F. Jones Administration Center, 4170 NYS Route 31, Clay, NY 13041. Attendance at the pre-bid meetings is not mandatory but strongly recommended. The Contract Documents may be obtained in hard copy or CD from Plan and Print Systems, Inc. 6160 Eastern Avenue, Syracuse, New York 13211, (Phone number 1-800-924-5145, Fax number (315) 463-1510). Hard copies may be obtained through a deposit of the sum of $100 per set. Electronic files on a CD may be obtained through a deposit of the sum of $25 per set. Checks shall be made payable to the County of Onondaga. Contract Documents are available for searching and viewing at www.planandprint.com. Click on the Plan Well logo, then click Go under Public Plan Room. Contract Documents may be picked up at Plan and Print Systems, M-F -8:30 to 5:00, or be delivered via UPS or FedEx upon request to Plan and Print Systems. Plans and/or CD may be shipped to the bidder upon receipt of an additional non-refundable freight charge of $35 and $20 respectively, payable to Plan and Print Systems by separate check or money order. Contractors/vendors have the option to provide Plan and Print Systems with their UPS or FedEx shipping account number to expedite the delivery of the documents. The full amount of the deposit for hard copy and CD sets of Contract Documents will be refunded to all plan holders who return their Contract Documents complete and in good condition to Plan and Print Systems within thirty (30) days following the Award of the Contract or the rejection of the bids. The Owner is exempt from the payment of sales and compensating use taxes of the State of New York and of cities and counties on all materials, equipment and supplies sold to the Owner pursuant to this contract. Also exempt from such taxes are purchases by the Contractor and his Subcontractors of materials, equipment and supplies to be sold to the Owner pursuant to this Contract, including tangible personal property to be incorporated in any structure, building or other real property forming part of the Project. These taxes are not to be included in the Bid. Each Bid must be accompanied by certified/bank check or bid bond in an amount not less than 5% of the amount of the base Bid.